We bought a place which has a creek running along the west border of the property into the lake across the street. Years ago the retaining wall collapsed and fell into the creek, redirecting the flow so that it has been eroding a big hole in the bank in our back yard. We took the Word of God to stand on “he maintaineth our lot” (Psalms 16:5), and proceeded to regularly lay our hand to the situation. Barbara has spent many hours shoveling gravel from one side of the creek to the other in order to shift the channel back to its original course. 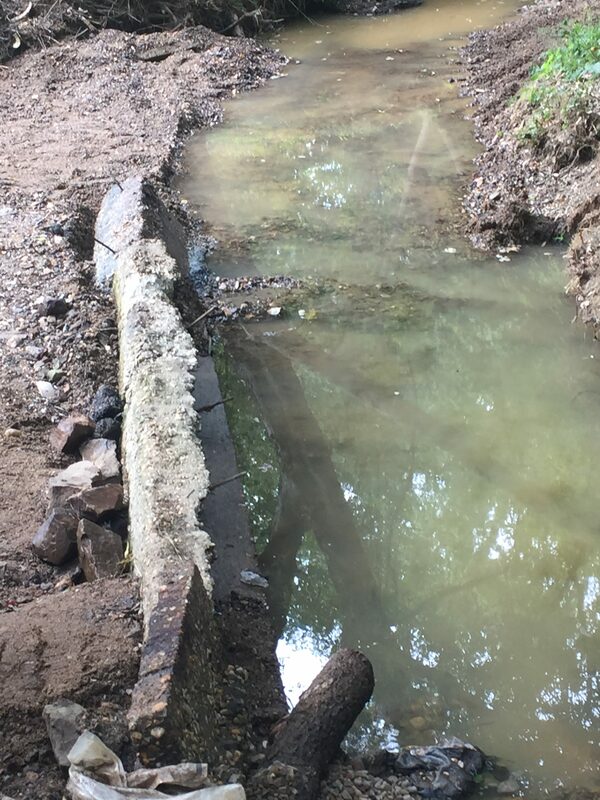 In the process we uncovered the concrete wall that was lying in the creek bed and exposed it so we could see clearly why the course was shifted. The same day a friend was here with his tractor to smooth out the gravel for our new driveway, was the day some men were working on the other side of the creek with a small track hoe, a small digging machine. The friend with the tractor hooked a chain onto the concrete wall in the creek bed and pulled it around so that now it is working for us to keep the water from eroding our property. The man working on the other side of the creek with the small digging machine heard and saw what we were trying to accomplish, and in about 30 minutes, his volunteered machine labor had the channel completely redirected to its original course with much of the gravel put back on our side of the creek. We praised God for getting accomplished in one day what was impossible for us to accomplish by hand. We had checked with the city and the county, and neither would/could get involved. We could have just said, “Well, that’s just the way the creek runs. God wanted the creek to go that way.” Instead, we took responsibility for the mishap. We put our faith in the Word and laid our hand to it in Jesus’ name. God, working through people, gave us our hearts desire of the creek running back in its original channel. We are in the process of building the area back that was washed away over the years prior to our purchasing the property. Sometimes things bad happen in our lives and we just say, “It was God’s will for that to happen.” If we will take an honest look at bad things that happen, we will see that it was due to somebody’s negligence, irresponsibility, or stupidity. If we will own up to our faults and failures in all truth, and take it to the Lord, the truth will set us free. We don’t need to blame God for our stupidity. We need to take responsibility, learn from it, and go forward. Take charge of how your creek runs.